Simple Tax Estimator Numbers Template is a template created in Numbers for Mac users. We have already made the Simple Tax Estimator in excel for windows users. 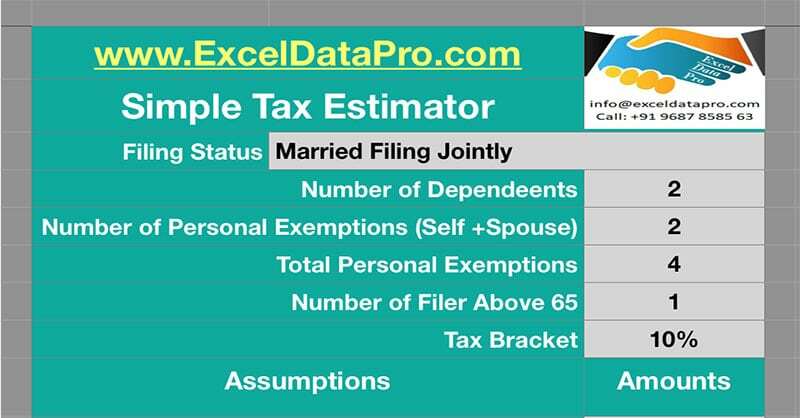 Simple Tax Estimator Numbers Template helps you to estimate your tax liability to be paid to IRS. The user just needs to enter the adjustments, tax credits, and some basic information and it will automatically calculate your tax liability. The filing deadline for Federal Income Tax Return due date for the year 2017 is 17th April 2018. Taxpayers should prepare priorly for filing to avoid last minute hassle. This can save you a lot of money. In last-minute preparation, you might forget some important deductions and that will eventually increase your tax liability. We have created a ready to use and free to download Simple tax Estimator Numbers Template with predefined formulas which will help you in estimating your tax liability. 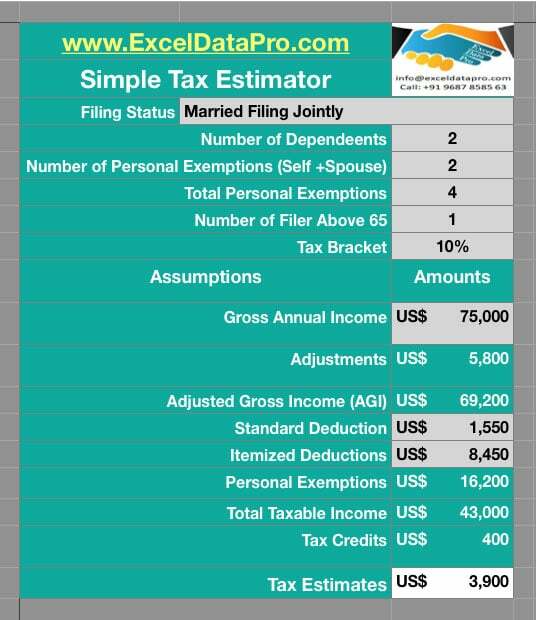 Click here to download Simple Tax Estimator Numbers Template. 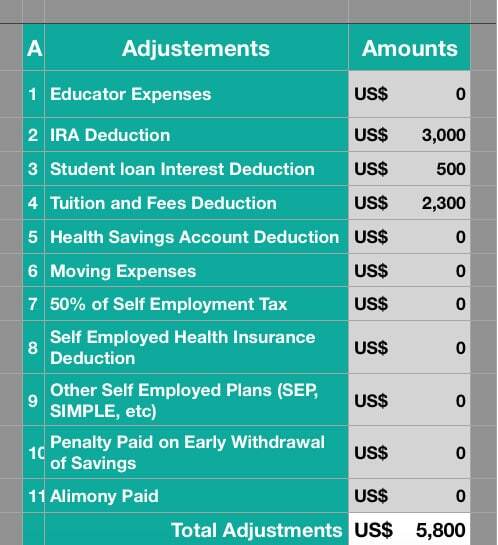 You can also download other Federal Income Tax Templates like Section 179 Deduction Calculator in Numbers. In addition to the above, you can check our Tax Glossary Section for which will help you know more about applicable deductions like itemized deductions, 401k Retirement plan, Child Tax Credit and much more. Enter the above details as applicable to you. Note: Personal exemption amount for the year 2017 is $ 4,050 by IRS. In addition to the itemized or standard deduction, if the filer or the dependent is above 65 you are entitled to Standard Deduction of $ 1,550. It can be claimed according to the number of dependants and spouse on a conditional basis. Gross annual income is the sum of your income from all sources. For calculating tax adjustments there is a different section given on the right-side of the estimator. Enter your applicable amounts and it will automatically reflect them in the estimator. AGI or Adjusted Gross income is the Gross Income less of Adjustments. Taxpayers need to choose between Standard and itemized deductions. If you go for standard deduction then you cannot claim the itemized deduction. AGI – Standard Deductions – Itemized Deductions – Personal Exemptions. As a taxpayer, you are entitled to some tax credits. 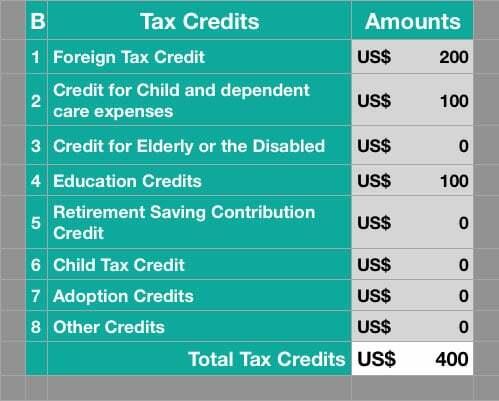 To calculate the total amount of tax credits, you can use the Tax Credits section on the right-side of the estimator. It will automatically sum up and reflect the amounts in the estimator. Tax Estimate or tax liability the amount to be paid to IRS as Federal Income Tax. Tax Estimate is the result of taxable income multiplied by the tax bracket.